Creativity and versatility are the hallmarks of Dr. Xin Sun's research at Pacific Northwest National Laboratory. And, they earned her the 2008 Laboratory Director's Award for Exceptional Engineering Achievement. Sun is a Staff Scientist in PNNL's Fundamental & Computational Sciences Directorate. The PNNL award honors Sun's development of advances in modeling and processes in materials and materials joining, leading to improvements in the automobile industry and other arenas. Sun's technical achievements have influenced the U.S. automobile industry—particularly in the understanding of weld strengths and the welding process. One of her colleagues observes that her technical achievements are directly reflected in General Motor’s new generation of vehicles. These advances in working with lightweight materials support the national energy efficiency mission of DOE. She also is a prime mover at PNNL in the development of transparent armor for the U.S. Army. She used the continuum damage mechanics model developed under the DOE-funded programs to model the projectile penetration process for transparent armor under high impact velocity. Her modeling work may enable the development of vehicles that will help increase the survivability of troops on the battlefield. Sun also has been a primary contributor to the development of modeling and simulation capabilities for Solid Oxide Fuel Cells (SOFCs), which are recognized globally by scientists and engineers in academia and industry. The multi-physics (MP) modeling capabilities are packaged in a software tool called SOFC-MP. SOFC-MP is now a commercial software tool used by leading fuel cell developers. 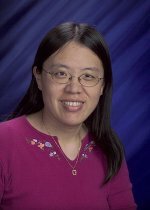 Sun is a prolific contributor to the technical community, has received a number of awards, and she is regularly engaged in mentoring, encouraging, and hiring new staff and interns at PNNL. Sun received her Ph.D from the University of Michigan in Ann Arbor in 1995.